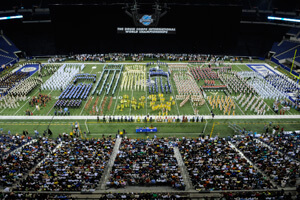 The Drum Corps International World Championships, Aug. 9 - 14 2010, will mark a week-long celebration of the "very best" in the world of marching music. Featuring a high level of performance excellence coupled with an intense competitive spirit, 40 drum and bugle corps made up of some 5,000 young performers will take the field throughout the course of the week, creating unparalleled excitement as they vie for the World Championship title. But the World Championships are more than competition and placements. With thousands of fans, supporters and alumni traveling from all over the world, "Finals Week" is also the biggest social gathering of the year for the entire drum corps community. In and outside the stadium, individuals can meet with friends both old and new to share their common passion for drum corps. 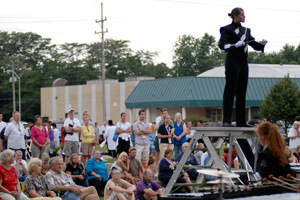 Use this guide below to plan your week and take advantage of everything Drum Corps International and the cities of Michigan City and Indianapolis have to offer. We'll be updating this guide all through the week with any new information that becomes available! 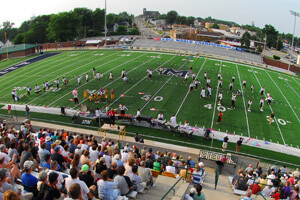 Opening Ceremonies Where: Ames Field, 2501 Franklin St./State Route 421, Michigan City, IN When: 6 p.m. CT Admission: Free and open to the public About: Kick off the 2010 World Championships with Michigan City Mayor Charles Oberlie and DCI Executive Director Dan Acheson at this event, which will feature a special performance by the defending Open Class Champions Blue Devils B. All competing drum majors will be recognized and the Michigan City High School band will perform the National Anthems of the United States and Canada. Racine Scouts Corps Manager Andrea Birbilis will also sing the Swedish National Anthem in recognition of Swedish corps Str?¤ngn?¤s who will perform at this year's Championships. Open Class Quarterfinals Where: Ames Field, 2501 Franklin St./State Route 421, Michigan City When: 5 p.m. CT Admission: $15 general admission About: For the third year in a row, Open Class corps start their quest for the 2010 World Championship title in Michigan City, Ind. Will Blue Devils B continue its current winning streak? Will this year's new Open Class competitors make a run for the Finals? The course of history will be set in motion as all Open Class corps come together at Ames Field. Open Class Individual & Ensemble Competition Where: Michigan City High School, 8466 Pahs Road, Michigan City When: 5 p.m. CT Admission: Free and open to the public About: Experience the talent and dedication of individual Open Class drum corps members who have gone above and beyond to prepare solo and ensemble pieces for this evening event. Hall of Fame Kickoff Party Where: Historic Union Station Grand Ballroom, 23 W. Louisiana St., Indianapolis When: 9:30 p.m. – 2 a.m. Admission: Access to the ballroom is free and open to the public About: A wildly popular event in 2009, Drum Corps International hosts its second annual Hall of Fame Kickoff celebration to start the 2010 World Championships in Indianapolis off right. Evening festivities include live music, games and auctions, with a special presentation recognizing the DCI Hall of Fame Class of 2010. Proceeds will benefit various Hall of Fame projects, one of which is the Jim Jones Leadership Scholarship, an award administered by a committee of Hall of Fame members. Corps Warm-Up Zone Where: White River State Park, 801 W. Washington St., Indianapolis When: Noon until last performing corps warms up Admission: Free and open to the public About: Come see your favorite corps warming up before their competitive Quarterfinals performances. Prepare to be entertained at this "show before the show!" DCI Festival Marketplace Where: Lucas Oil Stadium, 500 S. Capitol Ave., Indianapolis Marketplace Hours: 2:30 p.m. until stadium clears at end of Quarterfinals event Admission: Free with your ticket to the Quarterfinals About: Come grab some cool new gear from DCI, your favorite corps and DCI's corporate sponsors! Entertainment, souvenirs, information, and other items and activities will be awaiting. Learn more about the Festival Marketplace at Lucas Oil Stadium. Come Feel the Music Festival Where: Lucas Oil Stadium, 500 S. Capitol Ave., Indianapolis When: 2:30 p.m. – 11 p.m. Admission: Free and open to the public About: Before, during and after the World Class Quarterfinals, come join in on hours of fun and festive musical activities. Some special guests you'll see are Al Chez from the Late Show Band, the West Point Hellcats, the School Jam USA Rock Band Finalist, and plenty more. Want to gain some music skills of your own? NAMM is also presenting free music lessons as part of the event! With more than seven hours of family-friendly entertainment scheduled, come on by whenever you can and stay as long as you wish! Indiana residents: You can download a coupon for free kids tickets with every $10 adult ticket to this festival and the World Class Quarterfinals! Drum Corps Collectors and Historical Society Exhibition Where: Lucas Oil Stadium, 500 S. Capitol Ave., Indianapolis (Meeting Room 1, adjacent to lower level Grand Marketplace) When: 2:30 p.m. – 3:30 p.m. Admission Free with your ticket to the Quarterfinals About: Take a trip back in time to the yester-years of drum and bugle corps with this impressive collection of classic uniforms, display cases filled with collectible buttons, and other marching music memorabilia. During select times of this first-ever Historical Society exhibit, DCI Hall-of-Famers Steve Vickers and Don Warren will be on hand to autograph copies of their books. 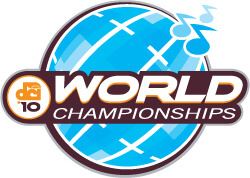 World Class Quarterfinals Where: Lucas Oil Stadium, 500 S. Capitol Ave., Indianapolis When: 3:30 p.m. – 11 p.m. Admission: Tickets start at $25 About: All 23 World Class corps will begin their quest for the World Championship title at this event. The top 17 when the evening's competition is completed will advance to the Friday evening Semifinals. Big, Loud & Live 7 Theater Broadcast Where: Nearly 500 movie theaters across the U.S. When: 6:30 – 11 p.m. ET/3:30 p.m. PT Admission: $18 (may vary by theater location) About: Can't make it to Lucas Oil Stadium, but still want to watch the incredible corps performances? Celebrate the "best of the best" as Drum Corps International presents its 2010 World Championship Quarterfinals LIVE on the big screen! Presented by DCI and National Cinemedia's Fathom Events, Big, Loud & Live 7, will be simulcast from Indianapolis' Lucas Oil Stadium into nearly 500 movie theaters nationwide. Big, Loud & Live 7 After Party and Fan Forum Roundtable Where: Hard Rock Cafe, 49 S. Meridian St., Indianapolis When: 11 p.m. – 1 a.m. Admission: Free and open to the public About: Following the World Championship Quarterfinals, drum corps fans can join the production crew, DCI staff and fellow fans at the famous Hard Rock Cafe to celebrate the "Big, Loud and Live" broadcast. As part of the Fan Forum Roundtable, you'll have the opportunity to talk one-on-one with DCI Executive Director Dan Acheson and Board Member Steve Auditore along with other special guests. If you've ever had a drum corps question you've been dying to ask DCI's "top brass" or just want to learn more about the current direction and future of the drum corps activity, now's your chance!. Corps Warm-Up Zone Where: White River State Park, 801 W. Washington St., Indianapolis When: Noon until last performing corps warms up Admission: Free and open to the public About: Here's another chance to watch corps warm up before they take the field for both the Open and World Class Semifinals. DCI Festival Marketplace Where: Lucas Oil Stadium, 500 S. Capitol Ave., Indianapolis Hours: 7:30 a.m. – 2 p.m., 3 p.m. until stadium clears after the Semifinals event Admission: Free with your ticket to the Semifinals About: Here's another chance to purchase souvenirs from your favorite World and Open Class corps! The marketplace will close from 2 to 3 p.m. for a break, and reopen for World Class Semifinals staying open until the stadium clears around 11 p.m.
Open Class Semifinals Where: Lucas Oil Stadium, 500 S. Capitol Ave., Indianapolis When: 8:30 a.m. – 1:30 p.m. Admission: $15 general admission tickets About: The field narrows to 17 as the Open Class corps continue their run for the gold, competing for the chance to advance to the Saturday morning Finals. Indy Artsgarden Exhibition Performance Where: Circle Center Mall, Indianapolis Artsgarden (Illinois and Washington St., Indianapolis) When: 12 p.m. to 1 p.m. 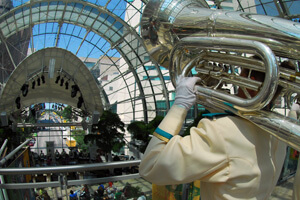 Admission: Free and open to the public About: Jersey Surf will be sure to rattle the glass at a special lunchtime performance in the magnificent Indianapolis Artsgarden, the home to more than 300 free performances and exhibitions each year. Learn more about the Indianapolis Artsgarden. DCI Headquarters Open House Where: 110 W. Washington St., Suite C (Northwest corner of Illinois and Washington Streets, below Weber Grill) When: 3 p.m. – 5 p.m. Admission: Free and open to the public About: Stop on by and have a chat with Drum Corps International employees while taking a tour through the DCI corporate headquarters in downtown Indianapolis. Drum Corps Collectors and Historical Society Exhibition Where: Lucas Oil Stadium, 500 S. Capitol Ave., Indianapolis (Meeting Room 1, adjacent to lower level Grand Marketplace) When: 3 p.m. – 4 p.m. Admission: Free with your ticket to the Semifinals About: Take a trip back in time to the yester-years of drum and bugle corps with this impressive collection of classic uniforms, display cases filled with collectible buttons, and other marching music memorabilia. During select times of this first-ever Historical Society exhibit, DCI Hall-of-Famers Steve Vickers and Don Warren will be on hand to autograph copies of their books. Live Learning Event Where: Lucas Oil Stadium, 500 S. Capitol Ave., Indianapolis When: 3:15 p.m. – 4:15 p.m. Admission: Free with your ticket to the World Class Semifinals About: Renowned marching percussionist Jeff Queen will lead a 60-minute interactive session sponsored by the Woodwind & Brasswind on proper practice techniques, sound quality, performance tips, and much more. 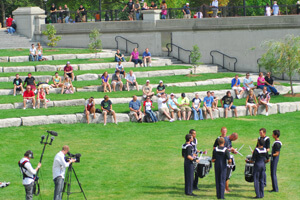 While focused on percussion techniques, Queen's presentation covers topics relevant to all marching musicians. He'll lead this event from the 50-yard line of Lucas Oil Stadium. Learn more about Jeff Queen. World Class Semifinals Where: Lucas Oil Stadium, 500 S. Capitol Ave., Indianapolis When: 4:30 p.m. – 11 p.m. Admission: Tickets start at $25 About: The World Class Semifinals features the top 17 World Class corps who will duke it out for a spot in the coveted Top 12 giving them one more chance to perform on Saturday. Star of Indiana Alumni Performance Where: Lucas Oil Stadium, 500 S. Capitol Ave., Indianapolis When: 10:15 p.m. Admission: Included as part of Semifinals admission About: The legendary Star of Indiana, active from 1985-1993, has reformed to put on a performance of some of the corps' most epic productions. The group consists of alumni from Star of Indiana, Brass Theater, and cast members of the stage production "Blast!" Age-Out Ceremony Where: Lucas Oil Stadium, 500 S. Capitol Ave., Indianapolis When: 10:40 p.m. Admission: Included as part of Semifinals admission About: Drum Corps International honors the graduating class of 2010 – corps members who have dedicated their time, passion and hard work to the drum corps activity over many years. Corps Warm-Up Zone Where: White River State Park, 801 W. Washington Street, Indianapolis When: 8 a.m. until last performing corps warms up Admission: Free and open to the public About: Here's another chance for you to watch corps warm up before they take the field for their final events of the 2010 season. DCI Festival Marketplace Hours: 9 a.m. – 2 p.m., 3 p.m. until stadium clears after the Finals event Admission: Free with your ticket to the Finals About: Here's your last opportunity to purchase souvenirs from your favorite World and Open Class corps! Open in the morning starting with the Open Class Finals, the marketplace will close from 2 to 3 p.m. for a break, and reopen until the stadium is cleared for the night. Learn more about the Festival Marketplace at Lucas Oil Stadium. Open Class Finals Where: Lucas Oil Stadium, 500 S. Capitol Ave., Indianapolis When: 10 a.m. – 2 p.m. Admission: $20 general admission About: The final showdown between the top Open Class corps who advanced from the Semifinals competition will be followed by a full finale of all 12 performing corps in their season-ending awards ceremony. DCI Headquarters Open House Where: 110 W. Washington St., Suite C (Northwest corner of Illinois and Washington Streets, below Weber Grill) When: 9 a.m. – 12 p.m. Admission: Free and open to the public About: Stop on by and have a chat with Drum Corps International employees while taking a tour through the DCI corporate headquarters in downtown Indianapolis. Drum Corps Collectors and Historical Society Exhibition Where: Lucas Oil Stadium, 500 S. Capitol Ave., Indianapolis (Meeting Room 1, adjacent to lower level Grand Marketplace) When: 3 p.m. – 5:30 p.m. Admission: Free with your ticket to the Finals event About: Take a trip back in time to the yester-years of drum and bugle corps with this impressive collection of classic uniforms, display cases filled with collectible buttons, and other marching music memorabilia. During select times of this first-ever Historical Society exhibit, DCI Hall-of-Famers Steve Vickers and Don Warren will be on hand to autograph copies of their books. Lucas Oil Stadium "Backstage" Experience Where: Lucas Oil Stadium (meet Missouri St. Loading Dock on west side of stadium), 500 S. Capitol Ave., Indianapolis When: 3:30 p.m. Admission: Free with ticket to the World Class Finals About: Feel the anticipation and excitement through a corps member's eyes right before heading into competition. During this backstage tour of Lucas Oil Stadium, we'll take you from the stadium entrance tunnel right out onto the field. Bring your camera so you can take your photo next to the DCI Champions Trophy! 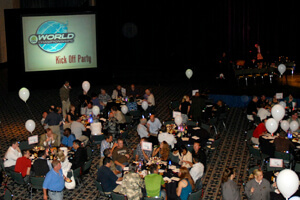 World Class Finals Where: Lucas Oil Stadium, 500 S. Capitol Ave., Indianapolis When: 5:30 p.m. – 11:30 p.m. Admission: Tickets start at $35 About: The Top 12 World Class corps will compete for the last time in 2010, and only one will be crowned Champion. These 12 fantastic corps will put on a show you won't want to miss!